What’s the difference between mortgage pre-qualification and mortgage pre-approval in NYC? When and how can I get a pre-approved for a mortgage? 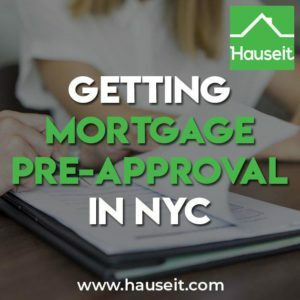 We’ll explain everything you need to know about getting mortgage pre-approval in New York City and even show you sample pre-qualification and pre-approval letters so you can understand the difference. Getting mortgage prequalification is much easier than getting mortgage pre-approval in NYC. That’s because you can get a mortgage prequalification letter with a short, simple, introductory phone call with a mortgage broker or bank. The mortgage broker or banker will ask you relatively basic questions about your income, debt and assets without conducting any document verification. This phone call typically lasts no more than 15 minutes. After your introductory call, your mortgage broker or bank will send you a customized, one page mortgage prequalification letter. The loan amount you are pre-qualified for will be a high level estimate based on the personal financial overview you told the mortgage banker. Real estate listing agents won’t take a mortgage prequalification letter as seriously as a mortgage pre-approval letter in NYC because of how easy it is to get. It may be fine to show a real estate agent that you are pre-qualified for a mortgage as an expression of interest, but you’ll need to have a mortgage pre-approval letter if you wish to submit an offer. As a result, a mortgage prequalification letter is most useful for yourself, to help you gauge how much you can afford before you spend too much time searching for a new home you might not be able to comfortably afford. Pro Tip: Read our guide on questions to ask your mortgage lender in NYC if you haven’t decided on a mortgage broker or banker yet. It’s important to work with someone who is experienced and has a good relationship with the underwriters at their institution. Aim to speak with your mortgage broker or bank about getting a proper mortgage pre-approval letter as soon as you’ve made up your mind to purchase a property. You do not need to wait until you have identified a specific property. If you’re fairly confident that you want to go ahead with buying a home in NYC in general, then it’s time to get a pre-approval letter lined up. Are You a Serious Buyer? Having a pre-approval letter will make it easier for real estate agents to take you seriously. That’s because they know you’ve taken the time to speak with a mortgage banker and send them financial documentation about yourself. Having a mortgage pre-approval letter also means the bank has spent some time partially underwriting your file, which means a legitimate institution has already vetted you to an extent. Furthermore, your buyer’s agent will have an easier time scheduling showings for you if they can tell listing agents that you are pre-approved for a mortgage and thus very serious about buying a home. Moreover, you’ll need to submit a mortgage pre-approval letter along with your REBNY Financial Statement when submitting an offer in NYC. If you don’t already have a mortgage pre-approval letter lined up by the time you wish to submit an offer, not only will this cause a delay but it will also demonstrate to the seller that you aren’t prepared or aren’t serious. Pro Tip: Read our tips for the mortgage loan process in NYC to learn how many banks you should get a pre-approval letter from and how much your credit will be dinged when a bank pulls your credit. The best way to get a mortgage pre-approval letter is to ask your buyer’s broker for a referral to a trusted mortgage broker or bank whom they’ve worked with before. Your real estate agent will be able to refer you to a local, NYC based mortgage banker who is able to navigate the city’s unique and complex real estate market. It’s interesting how once in a while you’ll find a buyer who is insistent on working with a mortgage lender from out of state. This is one of the best ways to throw a wrench in your deal, along with working with an inexperienced attorney who does not specialize in NYC real estate transactions. As much as we hate to vouch for big banks, the larger NYC based banks will usually offer the most competitive terms and the smoothest closing processes. That’s because they’ve done deals in most of the buildings in the city and have already pre-approved most buildings. Furthermore, their big balance sheets will often result in you getting the most competitive pricing. If you’re buying a condominium conversion or new construction condo, the sponsor will usually have a preferred mortgage lender who has already project approved the building. In this situation, we recommend getting a mortgage pre-approval letter from the sponsor’s preferred lender as well. In fact, many developers will make this a requirement of accepting your offer. Pro Tip: Read our guide on the NYC mortgage process to get a thorough understanding of how the mortgage underwriting to closing process works in New York City. We work hard and do our very best to help our customers have the best experience when shopping for a new home. This includes keeping our customers informed and giving them all the tools they’ll need when searching for and purchasing a new home. Today, we’re pleased to announce some great news for you. You are pre-qualified for an ABC Bank Mortgage. Please feel free to share a copy of this letter with sellers, real estate agents and real estate attorneys to express your interest in purchasing a home. Once you find your dream home and have signed a purchase agreement, please contact us so we can update your profile with information specific to the property and so we can begin processing your application. This pre-qualification letter is good for 30 days. Disclaimer: This Mortgage Pre-Qualification Letter has been issued based on the information you provided and is valid for 30 days. Once you have found a home you wish to purchase, we must still document your credit, income, assets, liabilities and other relevant information. This letter is not a binding commitment to make the proposed loan on specific terms. A formal mortgage commitment letter can be issued only after receipt and processing of your fully completed application and a necessary property appraisal report and other material information specific to your purchase contract. Pro Tip: If you’re buying a condo or house in NYC, you’ll have to pay the dreaded Mortgage Recording Tax. If you’re buying a co-op apartment however, you are free to skip this tax because co-ops aren’t considered to be real property. You can save on the Mortgage Recording Tax if the seller has an outstanding mortgage and agrees to you doing a purchase CEMA mortgage. Great news! You have been pre-approved for a mortgage in the amount of $800,000! This mortgage preapproval letter provides you with an estimate of the loan amount you may qualify for. This mortgage preapproval letter is based on our analysis of your employment, income, asset and debt information which you have provided, as well as credit information that we obtained from a consumer report. Please note that this mortgage pre-approval letter does not constitute a commitment to lend. You will need to finalize your mortgage loan application and we will need to verify and review your documentation before we can give you a decision on your application. A mortgage commitment will also depend on the property itself being acceptable and eligible for a loan at our bank. This may depend on the property appraisal as well as the title report. Please note that mortgage pre-approval letters are subject to change or cancellation if your loan no longer meets regulatory requirements or standards. This information is accurate on today’s date and is subject to change. *Assumes 1 point paid plus $1,000 in loan fees. *Assumes $1,000 in additional housing expenses: common charges or maintenance, NYC real estate taxes and home owners insurance. Pro Tip: Should you waive the mortgage contingency to make your offer more competitive? It’s something to carefully consider if the seller is holding a best and final offer auction and you are up against multiple bidders. Speak with your attorney and buyer’s broker about this first!